The volumetric cup fillers are the machine which is used to dispense variety of the products such as rice, beans, pop-corn, candy and pet food. These machines are equipped with different types of the cups which can be changed in order to accommodate the products of varying sizes. The volumetric cup fillers are equipped with small size of the filling which can be filled at high and medium speeds. Volumetric cup fillers are also equipped with set of interchangeable telescopic cups which can be handled automatically for the proper tuning of the heavy weights. Thus, the primary advantage of using volumetric cup fillers is that heavy weight can be easily adjusted automatically. The increasing prevalence of the advanced technology such as robotics and automation is anticipated to be the primary reason for the growth of the global volumetric cup fillers market during the forecast period.The global volumetric cup fillers market can be segmented on the basis of process type, form, application and region. On the basis of process type, it is sub-segmented into automatic, manual and semi-automatic. Automatic is anticipated to be the fastest developing sub-segment for the global volumetric cup fillers market during the forecast period. The increasing technological development is anticipated to be the key factor for the sub-segment to be the fastest growing during the forecast period. On the basis of form, it is sub-segmented into solid, liquid, powder and semi-solid. On the basis of the application, it is sub-segmented into pharmaceutical, food and beverages and cosmetics. Food and beverage is anticipated to be the largest sub-segment of the end-user segment. The increasing application of the volumetric cup fillers for the filling of the various types of food products such as beans, rice and pop-corns is anticipated to be the primary reason for the sub-segment to lead the end-user segment during the forecast period. 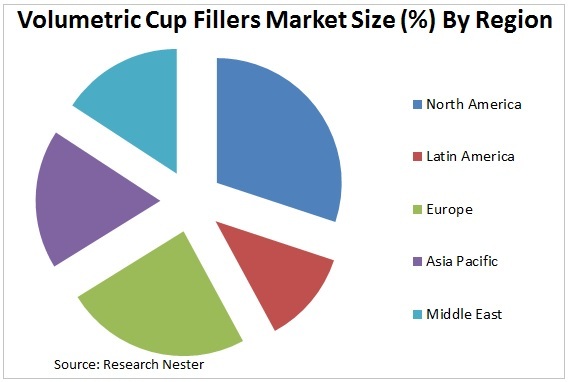 By region, global volumetric cup fillers market is segmented into North America, Asia-Pacific, Latin America, Europe, Middle East and Africa. North America region is anticipated to lead the global volumetric cup fillers market. The increasing manufacturing industries in the region are anticipated to be the primary reason for the growth of the global volumetric cup fillers market during the forecast period. The increasing technological development such as replacement of the old fillings with the advanced fillings is anticipated to be the primary growth driver for the global volumetric cup fillers market during the forecast period. Additionally, the changing lifestyle coupled with increasing demand for the small sized packaging options is anticipated to boost the growth of the volumetric cup fillers. The increasing consumption of the foods from various developing countries is anticipated to boost the demand for the volumetric cup fillers. These machine can handle different sized products which is anticipated to increase the demand for the volumetric cup fillers which in turn boost the growth of the global volumetric cup fillers market during the forecast period. However, increase in the overall cost on the account of integration of advanced technology is anticipated to restrain the growth of the global volumetric cup fillers market during the forecast period.